The research of a test in which a research subject was asked to draw a picture of a dog four times, at different stages of his exposure to transcranial magnetic stimulation. 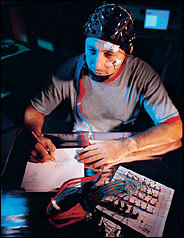 Hooked up to the Medtronic Mag Pro, a test subject begins the series of tests to show the effect of transcranial magnetic stimulation. n a concrete basement at the University of Sydney, I sat in a chair waiting to have my brain altered by an electromagnetic pulse. My forehead was connected, by a series of electrodes, to a machine that looked something like an old-fashioned beauty-salon hair dryer and was sunnily described to me as a ''Danish-made transcranial magnetic stimulator.'' This was not just any old Danish-made transcranial magnetic stimulator, however; this was the Medtronic Mag Pro, and it was being operated by Allan Snyder, one of the world's most remarkable scientists of human cognition. Tiny, Wireless Video Camera Kit ONLY $79.99! Find more results for Brain and Science and Technology .